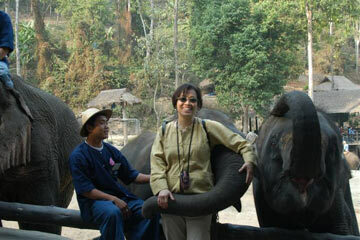 When former ESOL student, Dr. Usa Bunnag, was in Thailand for her “Smile on Wings” program (see her article), she met some elephants that know how to paint pictures. 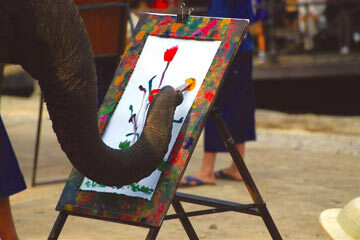 She noticed that some of the elephant artists were better than others. The one in this picture was one of the best, so she wanted this one to paint a picture for her. 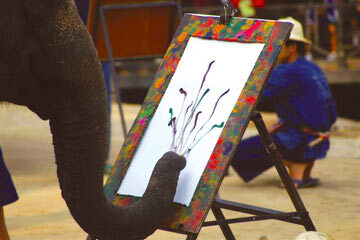 First the elephant painted the flower stems. Dr. Bunnag was able to request the colors of the flowers in her painting. 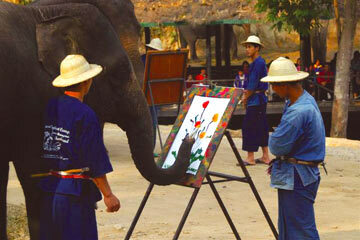 The trainer told the elephant what colors Dr. Bunnag wanted. This is the Dr. Bunnag’s painting when it is almost finished. Dr. Bunnag’s dental patients can see the finished work in her office in Bethesda.